There has been a lot of talk about fake news on the internet. Facebook and Google have been under pressure to suppress fake news. Not an easy task. But now these internet giafnts have a bigger problem – being held accountable to advertisers. Advertisers want to see toxic free content. Advertisers don’t want their branding besides toxic content. Many advertisers pulled out of YouTube advertising as their ads were seen on hate speech videos. Google fixed this quickly. What is Toxic content? 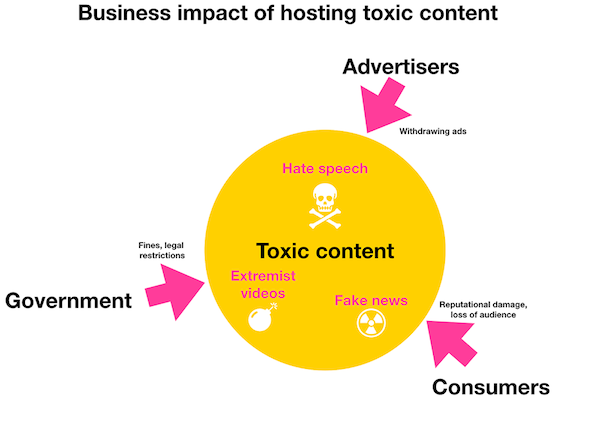 Any content that promotes fake news, hatred, hate messages from terrorists, discriminatory in nature or has explicit sexual and pornographic content can be termed as toxic content. Why are advertisers up in arms? Simple, it is hurting families, kids are seeing all sorts of ads and this can really muddle up their thinking. It is not possible to monitor your child’s digital usage every moment. Unilever, the world’s 2nd biggest advertiser, threatened to pull its ads from Facebook & Google unless they improve transparency about news, protect children from toxic online content, and crack down on hate speech. In 2017, Unilever said Digital ad spend accounted for 1/3rd of their total ad spend (an increase of 130% since 2012). The biggest beneficiary of their ad spend was TV (both in 2012 and 2017). With a digital ad budget of €2.5bn (£2.25bn / $3.12bn) in 2017, no digital platform can afford to ignore Unilever’s concerns. Unilever does not want to advertise on platforms that do not “make a positive contribution to society”. Unilever said it “will not invest in platforms that do not protect children or which create division in society”. Unilever warned if digital media houses should clean up before users stop viewing, advertisers stop advertising and publishers stop publishing. On responsible platforms: Unilever will not invest in platforms that do not protect children or which create division in society, and promote anger or hate. On responsible content: Unilever is committed to creating responsible content, initially by tackling gender stereotypes in advertising through the Unstereotype Alliance. On responsible infrastructure: Unilever will only partner with organisations that are committed to creating better digital infrastructure, such as aligning around one measurement system and improving the customer experience. This email is a follow-on update to our communications and announcements in September 2017 regarding advertiser controls. Facebook is committed to building a prosperous ecosystem for both our publishers and advertisers. We have consistently heard from advertisers that greater clarity and control over the context in which their advertisements are shown is a critical requirement. As a result, we announced in September that we would be providing advertisers with pre-campaign and post-campaign lists of publishers where their advertisements ran. The pre-campaign list is now in the process of rolling out. As a next step, we will also be rolling out to advertisers a post-campaign list of publisher names where their ads ran, across Audience Network, Instant Articles, and Ad Breaks. In addition, we are beginning to explore options for sharing with advertisers post-campaign information about what portion of their overall Audience Network spend was spent/delivered on particular publishers. Several designs for this size transparency will be tested with advertisers so that we can select the option that best supports the health of our ecosystem. We are taking these steps to benefit publishers as well. Our demonstrated commitments to brand safety have been positively received by advertisers, and we are optimistic about the impact that these additional functionalities will have on publisher revenue and network growth. We are committed to brand safety for both advertisers and publishers and will also be rolling out additional features for publishers to access on Monetization Manager in the coming months. We will keep you updated on our progress and share more as we add to these efforts.Please reach out to Facebook if you have any questions about these developments. Procter & Gamble (P&G) has already slashed their digital ad budgets. P&G has been complaining about spending on non-viewable ads and ads besides toxic content. Verizon, AT&T and Walmart have similar concerns. Advertisers in India too will have the same concerns. Facebook recently fixed holes that allowed advertisers to target campaigns by race and religion. Facebook plans to ban ads promoting cryptocurrency schemes, which is seen as scammy ads. Apple’s CEO Tim Cook had attacked advertising-supported business models for their disregard for users’ privacy. Even current Facebookers acknowledge now that they missed what should have been obvious signs of people misusing the platform. And looking back, it’s easy to put together a long list of possible explanations for the myopia in Menlo Park about fake news. Management was gun-shy because of the Trending Topics fiasco; taking action against partisan disinformation—or even identifying it as such—might have been seen as another act of political favoritism. Facebook also sold ads against the stories, and sensational garbage was good at pulling people into the platform. Employees’ bonuses can be based largely on whether Facebook hits certain growth and revenue targets, which gives people an extra incentive not to worry too much about things that are otherwise good for engagement. If the company started taking responsibility for fake news, it might have to take responsibility for a lot more. Facebook had plenty of reasons to keep its head in the sand. In an effort to increase the trust factor, in April 2018, Facebook added a button to get the background information on the article and the publisher. Fraud Prevention: Ads.txt was introduced to reduce Ad Fraud but fraudsters have found a way to exploit Ads.txt. MetaX has introduced Ads.txt Plus by bringing Ads.txt to the blockchain. Media Buying and Selling: To enable publishers and advertisers to buy and sell ads with fewer intermediaries, or even directly. It is time all players in the digital eco-system need to agree we need toxic free content for a better & brighter future.